It’s that time again. 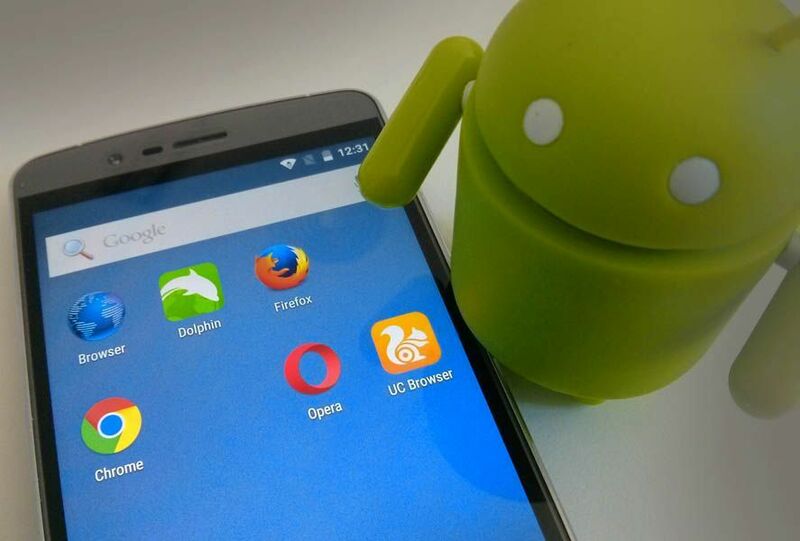 It’s now been a full six months since our last browser comparison (from September 2016), so you’re probably eagerly awaiting our latest half-yearly report on the four most popular Android browsers at the moment: Google Chrome, Mozilla Firefox, UC Browser, and Opera. As on previous occasions our comparison covers several aspects: RAM use, app opening speed, and compatibility. In the interest of contrasting today’s analysis with our previous ones, we’re going to be using the same test device as we used a year ago – a Google Nexus 7 (2013) with Android 6.0.1 – while the versions for each browser are the latest ones to date released on the stable channel: Google Chrome 56.0.2924.87, Firefox 52.0, Opera 42.6.2246.114522, and UC Browser 11.2.5.932. We’ll be looking at: how much memory the app takes up after its installation, opening time after successive iterations, RAM consumed when running, performance based on several benchmarks, and an admittedly subjective but still important evaluation of usability. The intrinsic capabilities of each app fall beyond the scope of this analysis, as this sort of data can be easily consulted on each developer’s website. How much space an app takes up is a super important thing to keep in mind given how limited so many devices are in this respect. We’re going to consider the size of the APK before a clean installation and the app itself afterward, plus the amount of data used after doing all the tests below. Winner: Except for Chrome, all the apps have lightly inflated the amount of space they take up since last year, though even with this increase Firefox remains the lightest one. Interesting tidbit: Opera Browser doesn’t break 2MB in terms of temporary data storage. Winner: In this case, Firefox was the fastest responder from a cold start. Unlike our analysis from last September, we’ve run our tests this time after closing the services run by Chrome in the background so that we’re measuring everything by the same metric and getting rid of the “home advantage” Chrome enjoyed due to so many of its functions being resident in the system. Don’t be fooled: the amount of space occupied by an app is not the same as the memory used by the associated running processes and the cache generated for the optimum functioning of the app in question. We’ve taken our data here straight from Android’s own app manager and included all open elements for each one. 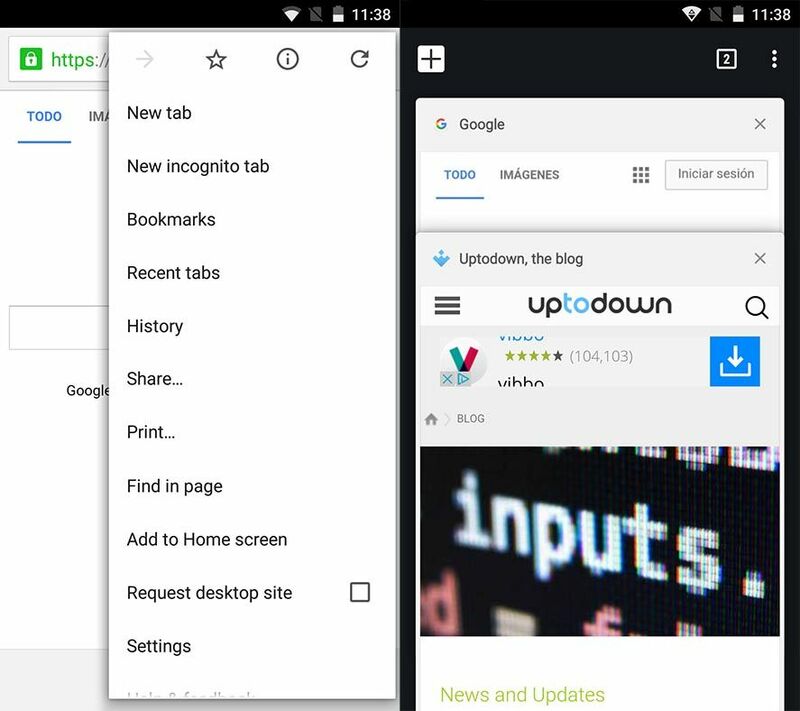 More specifically, we opened the browser with three tabs immediately after a clean startup of the device: the Uptodown homepage, Wikipedia, and a blank Google search tab. Plus to contrast that info we use the useful app Simple System Monitor which lets us keep a monitor window open in real time while we open the aforementioned browser tabs. Winner: Odd and revealing results this time around with a deeper analysis than we’ve done on previous occasions. We’ve contrasted the amount of RAM taken up when the browser is both open and closed to see which elements it leaves running. The case of Opera is particularly interesting. 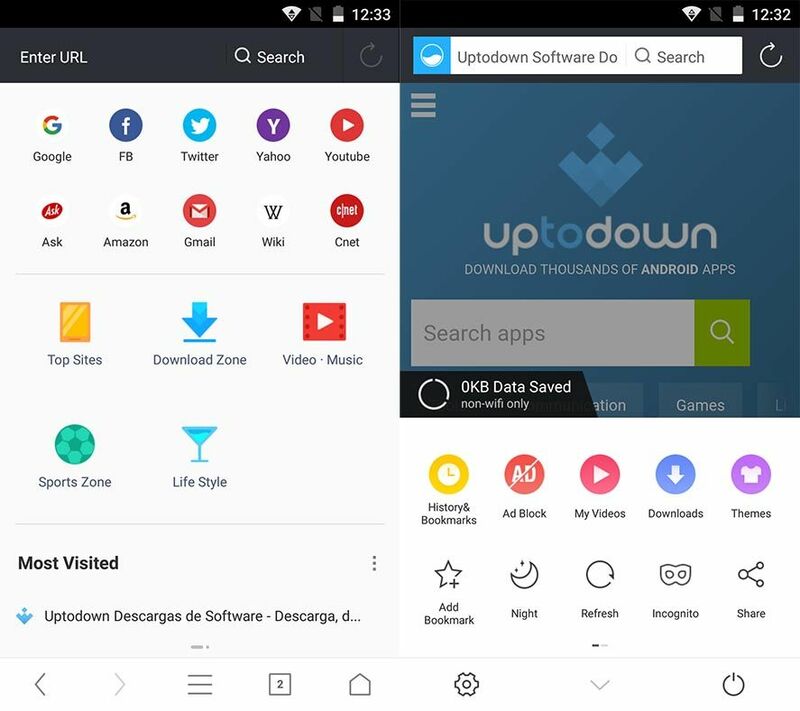 When you open it the app opens different processes for each tab, making the total RAM use considerable, though with an enormous boost to stability, as if one tab crashes it won’t bring the whole app down. But when the browser is closed the remnants that stay in memory are practically null – exactly the opposite of what happens with Chrome, for example, which leaves a whopping 123MB inflated in your device memory. With all this in mind, taking an average of the two measures, we again stick with Firefox for its economical use of resources in both scenarios. Winner: The stats above aside, Firefox suffered a couple blockages with JetStream, while UC Browser had serious problems in finishing the analysis as it got stuck on some of the steps and trailed behind the others in all the tests. Opera and Chrome, in contrast, have emerged from this test unscathed and we can deem them the most compatible of the four. Google Chrome: Invincible at the aesthetic level, mainly because it’s the most familiar and follows the same lines as its desktop variants. Robust, sober, no flourishes. There’s a reason Android is Google’s, after all. Opera Browser: Minimalist without neglecting functionality. 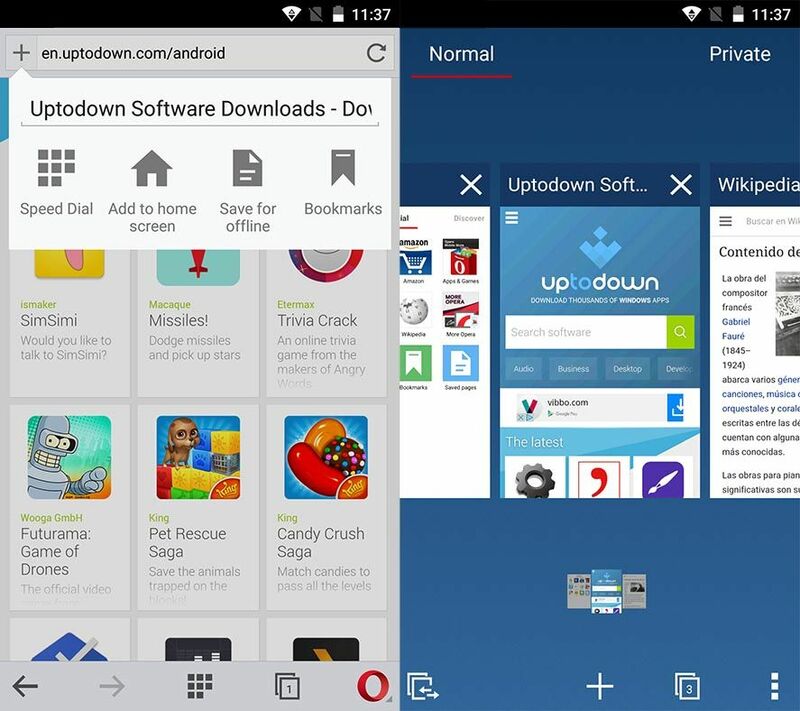 Opera Browser knows how to differentiate between a clear, unimpeded experience and content enriched with bookmarks and recommendations. Firefox: Chrome-esque in its aesthetic, with a boost to usability for certain functions like managing open (and private) tabs. 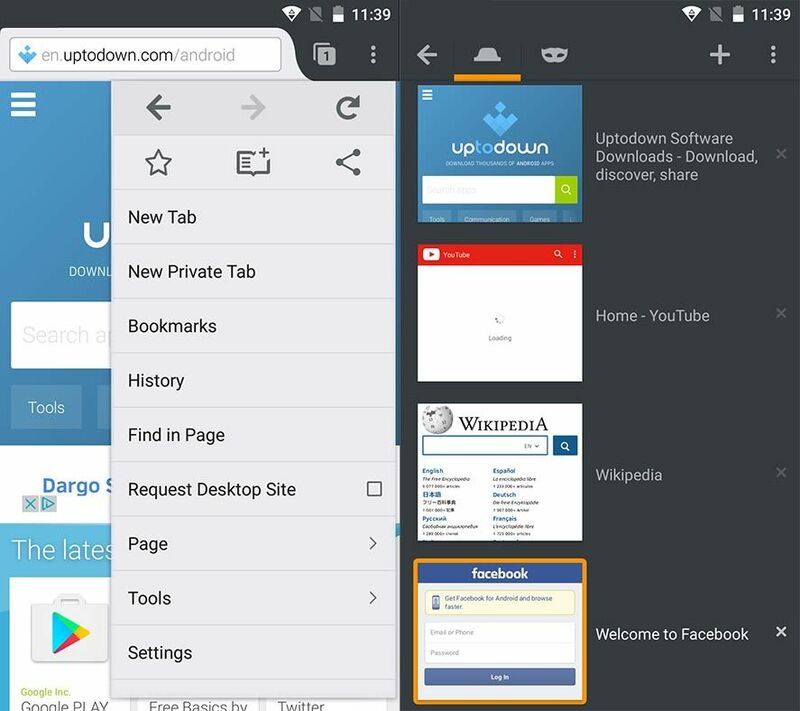 UC Browser: Simple and efficient but with a defect that keeps it out of the league of the others: it’s got TOO MANY unnecessary complements in the form of browser bars, recommended sites, an integrated app store, sponsored links, and other bits and bobs that may well be optional but should still come deactivated by default. Winner: We’ll go out on a limb and admit that Google Chrome gives us the best feeling when browsing and accessing the basic controls for managing tabs, favorites, and its options panel, mainly due to the aforementioned familiarity of the system. As in previous comparisons, the crown is still bitterly disputed between the top two contenders, but this time we’ve seen that Mozilla Firefox is a step ahead in terms of both speed and optimization of resource consumption. Opera continues to live in its own parallel world where the best product is its Mini version, while UC Browser is basically a residual product that’s still drunk on the elaborateness of unnecessary content. Chrome is the only one giving Firefox a decent challenge, though it’s got a lot of ground to cover. We have yet to see, however, if it makes a great leap forward with its upcoming version 57 on the stable channel, with the promised reduction in memory use.